Carrying on from the post below, I know it isn't possible to read the Southside People article - the paper's simply too big for my scanner! So you can read it here, in this different scan - or you can see it online at http://www.dublinpeople.com/content/view/1064/57/ . 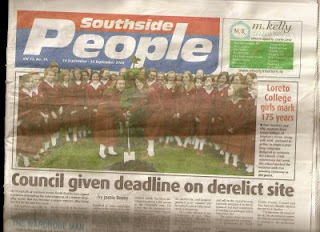 It appeared on the front page of the 24th September issue under the headline "Council given deadline on derelict site." 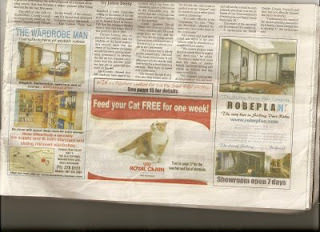 For coverage in the Tallaght Voice, see the post immediately before this. We have had an incredible response from people in Greenhills and the wider Dublin 12 area in South Dublin County to our petition on the derelict site of the old McHugh's Shopping Centre. We delivered just over 1,000 petitions door-to-door in Greenhills Estate, Greenpark, Limekiln and Temple Manor. 40 freepost envelopes from the last batch delivered. When you consider the majority of people took the trouble either to buy a stamp and post a letter, or deliver it by hand to my door, or log on online and sign up or email our campaign, you can see the serious community response there has been to this stain on our community. There, are, we believe, much more to come. We are confident that by the end of our campaign more than 500 local people will have signed the petition demanding action either by the developer, or, as we suspect, failing any action on his part, by the Council. I have, in all honesty, never met with such a positive reaction from local people to a political campaign - mostly because people knew about me from previous canvasses and leaflets, know my record and that of the Labour Party in the area, and knew we were genuine. This campaign has hit the headlines in all local papers. The Southside People covered it on their front page - the first time our campaign has been covered in this way. We also had a substantial presence in the Tallaght Voice (see below) and the Tallaght Echo, and were also covered in at least one other local publication. For the first time in 5 years, it seemed, our efforts have brought this issue to the fore - making, quite literally, front page news. Other parties standing for election in Greenhills have obviously been taken aback by the huge response to the campaign I have launched. Amongst them have been the Socialist Party, who organised, over the weekend, a public meeting on the issue. This was held with approximately 70-80 people in attendance in the Greenhills Community Centre tonight. Various political figures attended and spoke - Cllrs Mick Murphy (SP), Colm Brophy (FG), Cáit Keane (PD - soon to be something else) and Pat Dunne - blogged about here before. Pat curiously announced his intention to run next year for the People Before Profit Alliance, a Socialist Workers' Party-dominated outfit which was vehemently opposed by the last similar alliance he was involved with, the Campaign for an Independent Left. A number of local residents and people who had worked at the centre spoke passionately about the loss of local services and the dereliction Greenhills is now faced with on a daily basis. Sadly, the meeting, in my view, was not well-organised and poorly-chaired, although from my own experience of similar meetings both locally and nationally this is a common problem. It descended into farce at one stage with the Socialist Party chair and FG Councillor Brophy engaging in an unceremonious screaming match while baffled local residents - myself included - looked on. The SP had no particular solutions or answers to the community's concerns, other than to hope really hard that the developers take on board our views and maybe, just maybe, they might tidy up the site - perhaps, bafflingly, by building a car park. Mick Murphy scoffed at our campaign for a Compulsory Purchase Order, claiming we were "chasing rainbows." Cllr Murphy, it should be noted, has previously called for a CPO on the site on more than one occasion, and has also called for a CPO on the site of the old petrol station at the end of the Greenhills Road in Tallaght Village. Nor did other political figures seem to have any real targets or solutions. On the conservative side, Cllrs Brophy and Keane indicated that they wished only to pursue issues through contact with the developer - similar to Murphy - or on the Council committee. The PBP candidate called for a meeting between the developer (McHugh), Louis Fitzgerald - the publican who owns the Traders Pub next door and who has expressed an interest in the site - and local political and community representatives. I would be happy to attend such a meeting but don't believe it is, in itself, an adequate community response. Unlike Cllr Murphy and Candidate Dunne, I believe very firmly that there is both scope and possibility, with public action, for a CPO of the site, and for its appropriate development in the needs of the community. And having spoken to plenty of residents both at and after the meeting - many of whom came to us to sign the petition - I am convinced that this approach is best for Greenhills. People often associate groups such as the SP and the PBP with 'hard left' positions, but in truth tonight's meeting showed a bankruptcy to their arguments that was nowhere near the left. There was plenty of talk of facing down developers and speculators but, faced with an existing and mass community campaign, rooted in Greenhills and its people, the best they could do was make a few suggestions - some of them random, others bizarre - in the hope of bringing pressure to bear on the developer involved. Don't get me wrong. I prefer to work with others on the left and baulk at any sectarian abuse or critiques of other progressives. These are two fine candidates and will appear higher up my ballot than the variety of conservative candidates in Tallaght Central next June. But as a socialist who believes both in utilising both the parliamentary - in this case, on the local Council - and the extraparliamentary, and who believes in the maintenance and development of public space and the public sphere through local democracy, the attitudes of the other 'leftists' baffled me. Fact is that the pressure has now been put on by the power of our campaign and that, given McHugh's continual failure to act over 5 1/2 years, this community response now needs to take aim at the Council. I believe the site to be derelict and to fall under the description of dereliction outlined in the 1990 Derelict Sites Act - and Council officials, who agreed with this analysis in 2006, will now be made realise the huge outpouring of community feeling to the site's dereliction and the need for its development. 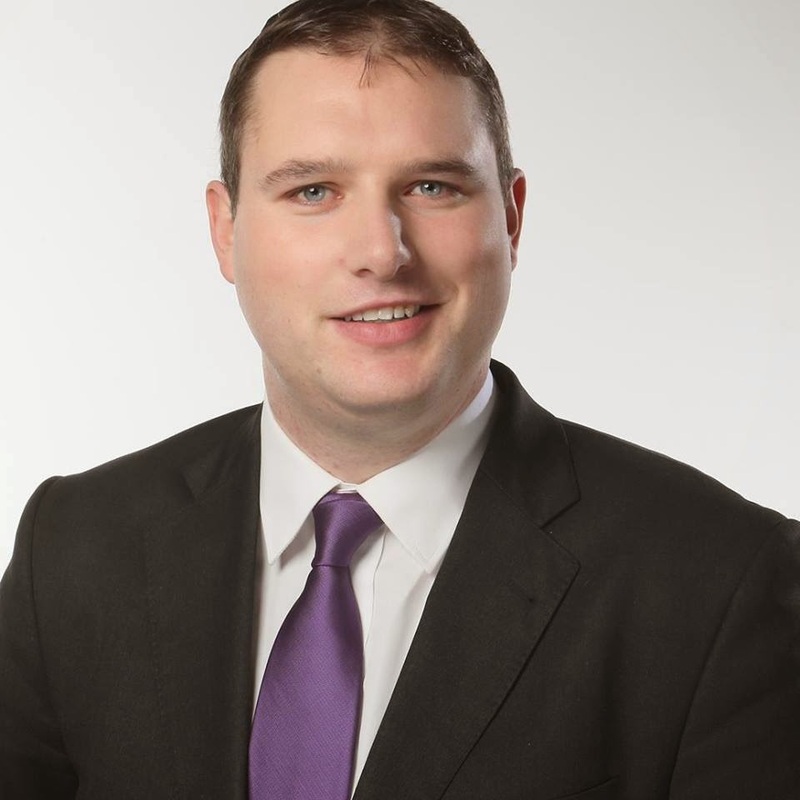 Neither Cllr Murphy, who is based on the old Tallaght Area Committee, nor Candidate Dunne have access to the relevant Council meetings at the Terenure Rathfarnham Area Committee (TRAC). My Labour colleague, Cllr Eamonn Walsh, is continuing to push the issue and is raising it again at the next TRAC meeting on October 7th. Our experience to date has shown that committee work alone cannot achieve victory. But with a true community response, both in the future of the campaign and at the polls next June, progress is more than possible. PS - If you haven't done so - don't forget to sign! Perhaps the most significant political campaign I have ever been engaged in was concerned with people and places far away from my local hills of green, derelict sites and all. The boycott of Coca-Cola products in UCD, a campaign twice won by students in 2003 and 2004, has since spread to dozens of colleges and other institutions worldwide. Many will know the background to union busting by Coke bottling plants in Colombia and the subsequent campaigns for justice. But even if you don't, yesterday's excellent article in the Guardian by British activist-comedian Mark Thomas, who has written a book on the issue, is well worth a read. In UCD, we were able to take on the biggest corporation in the world, and beat it - twice. Through that kind of solidarity, gains at all levels of politics are possible. As a local area representative and someone who has grown up and lived all my life in Greenhills, I know full well how great a community this is. We are rightly proud of our great local achievements and the wonderful work done by volunteers at all levels to create the community spirit which has defined our area for decades. But that community spirit can’t thrive in an area without a neighbourhood centre. We cannot prosper when faced on a daily basis by neglect and dereliction. We deserve better than more than five years of shabby boards, gruesome fencing and weeds, and an eyesore which has come to define us. The old McHugh’s shopping centre on St James’ Road was an important resource for local people to buy their messages, to see a pharmacist and to use the post office. It was destroyed by fire in 2003 and despite plenty of applications and negotiations, the site remains a derelict mess. Let us be clear – the developer, now known as “Property International McHugh,” is at fault for this shambles. We have waited long enough for him to take action – more than five years, in fact. Will it be another five, or longer again, before local people are rid of this eyesore? How long will it be before our neighbourhood centre is restored, and with it the vital services that older people and families need? Myself, Eamonn Walsh and the Labour Party have stood firm on this for years. Now it’s time for local people to take this campaign one step further. Below, you will read the facts of this debacle and you will be given a chance to sign the petition. Please go here to do so. Dermot Looney, Labour’s local area representative and the Greenhills candidate in next year’s local election, has launched a community campaign demanding appropriate action at the McHugh’s site. Here you can read the timeline of development on the site and sign the petition demanding action. 12th March 2003 – A planning application (SD03A/0143) is made to change the roof & signage on the McHugh’s Shopping Arcade. Just weeks later, the entire centre is gutted by fire. 20th June 2003 – A planning application (SD03A/0415) to demolish the remains of the centre is made, and approved by the Council. 15th August 2003 – McHugh’s apply (SD03A/0601) to construct a three storey building mixing retail and apartments, including a basement car park. This is first deemed invalid as there was inadequate notice of the planning application at the site. A duplicate application (SD03A/0659) for planning permission is then submitted. The development will include two storeys of apartments (8 one-bedroom, 4 two-bedroom). It is opposed by residents groups and Cllr Eamonn Walsh. Further information is requested by the Council, who then approve the application in April 2004 with 26 conditions attached. 4th April 2006 – Council note that “it is proposed to commence the procedure to acquire the site by Compulsory Purchase Order under the Derelict Sires Act 1990,” at the Terenure Rathfarnham Area Committee (TRAC) meeting. 5th April 2006 – Another application (SD06A/0248) is made. It will also have three storeys, but this time there will be 10 one-bedroom apartments, 10 two-bedroom apartments and 1 three-bedroom apartment. The Council note that “the residential density of the proposed scheme is excessive” and demand a reduction in the number of apartments. McHugh’s do not bother to meet this demand and the application is deemed withdrawn on December 4th. 30th January 2007 – Yet another application (SD07A/0062) is made. It has three storeys with retail units on the ground floor, but with the Council’s restrictions it has 15 apartments on the top two floors (12 two-bedroom units and 3 one-bedroom units). It is granted in April. The Council requests more than €250,000 to be furnished for Council infrastructure and facilities. 6th February 2007 – The Council finally confirm the site as ‘derelict’ at a TRAC meeting. 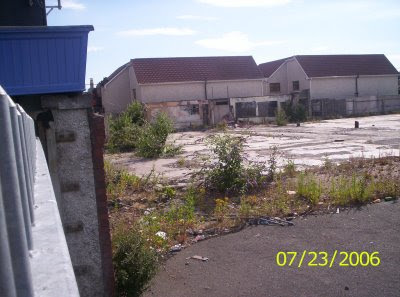 6th November 2007 – Cllr Eamonn Walsh tells the Council that “In view of the failure of the developer of the derelict shopping centre site to proceed with the development as agreed last May that the C.P.O. be re-introduced and to state that local residents are sick and tired of the false promises as they look onto a most offensive site in the heart of its community.” The Council take no action. 11th January 2008 - a small commencement fee is paid with commencement of work due to start on 28th January 2008 and a proposed end date of 30/1/2009. 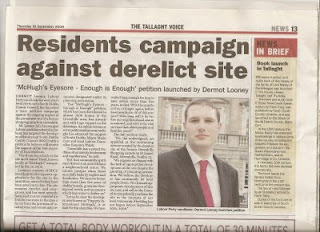 12th June 2008 – Dermot Looney complains to Council that the use of the site as a storage ground for Dublin Bus is in breach of the planning permission. The Council reject the complaint. 12th September 2008 – Despite claims to the contrary, bus stops and other material remains stored at the site. No development work has started – 5 years on. Labourstart.org , that most magnificent site for trade union campaigns the worl over, reports yet another success. support and solidarity via the LabourStart campaign as well as PSI affiliates"
Labourstart first came to my attention during the Joanne Delaney campaign, which it promoted worldwide to great effect. Just as greed and exploitation know no borders, neither should solidarity. Make sure to visit labourstart.org today, sign up to their petition campaigns, and make a difference to the thousands of Meryem Özsögüts and Joanne Delaneys across the world. I had a text read out on RTÉ's Drivetime programme just before six o'clock this evening in relation to class size. For some reason my name wasn't mentioned, but you can hear it here by going to 1.25.55 in the programme. "This from a newly-qualified primary teacher who says he's in a great school with a brilliant staff but his first ever class has 32 pupils. The school has to work extra hard to fundraise for necessary resources and technology. Surely, he says, a nonsense like this should be consignded to the past. In an economic downturn, serious investment throughout the education system is a requirement, not an option. Shame on the shortsightedness of the government."